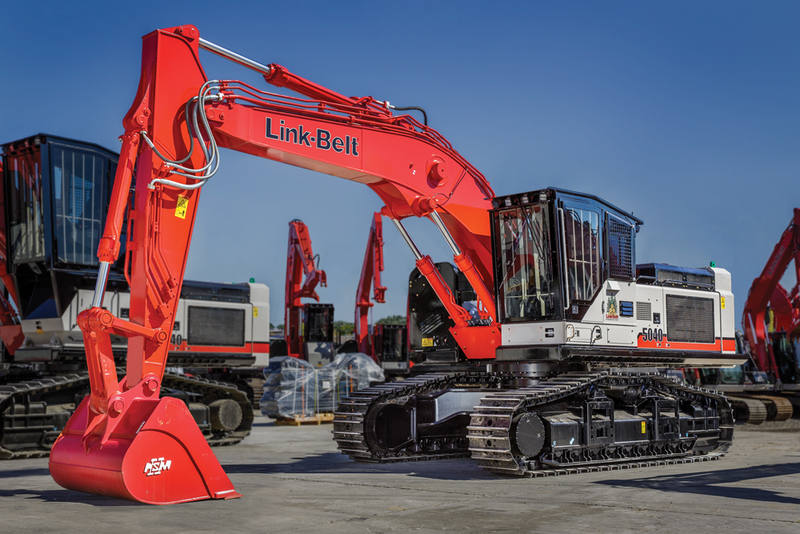 The Link-Belt 4640 Road Builder, 4640 Timber Loader, 5040 Road Builder, and 5040 Timber Loader are now available for the US and for Canada. RB models can be equipped with buckets, thumbs or grapple attachments for pioneering, right-of-way logging, access road maintenance and construction applications. Standard TL configuration includes Live-Heel attachment for log-loading applications. Designed specifically for these models, side-entry Oregon-OSHA/ROPS/WCB and rear-entry Oregon-OSHA/WCB certified forestry cabs are available from the factory, with sky roof and escape hatch. This new “40 Series” of foresty equipment features an advanced, electronically-controlled Isuzu engine that meets Final Tier 4 requirements, with up to 15% cycle time speed increase than previous models. Experience less downtime due to refuel, with a 55% fuel capacity increase. A 2-3% DEF (Diesel Exhaust Fluid) consumption rate relative to fuel consumption, with no diesel particulate filter (DPF) maintenance constraint. In addition, a dedicated and proprietary main control valve is tuned for enhanced TL performance. The cab offers unprecedented operator ergonomics, comfort and visibility. The SCM air-suspension, heated and tilting seat provides exceptional lumbar support and reclines at a 155° angle for a relaxed environment during breaks. Arm rests move proportionally with the console, which means that the distance and angle between joysticks and operator remains the same, no matter how the seat is adjusted. With a large, 7-inch LCD color monitor to interface with the machine, an operator can easily navigate a full menu of user-friendly controls to take full command of the machine and attachments. The standard rear-view camera displays a panoramic view of the work site from the rear of the machine, with sight guidelines added for increased safety. Other notable cab features include: remote fob-activated LED lighting; a cup holder and storage areas for cell phones and other small items; job ticket slot; newly designed joysticks with easy-to-hold grip and radio mute buttons; new MP3 audio input, for hands-free communication. These machines are equipped with the RemoteCARE® GPS-enabled telematics system, enabling 24/7 remote monitoring and security. RemoteCARE tracks routine and major service intervals, as well as current machine health, providing more flexibility and control when determining when and where to service machines. The system also provides machine location for better job supervision and remote security monitoring. Flashing diagnostic codes on the monitor quickly alert the operator to potential trouble. Servicing is a snap, with convenient access to all routine service points, including sample ports for engine and hydraulic oil. The 5040 RB and TL models were introduced last month at Demo International 2016 in Maple Ridge, British Columbia in Canada.